Author Written by Cleo Isco and last updated on Posted on June 1, 2016 . Posted in Categories SAP Certification FAQ. Earlier this year SAP introduced a new big thing in the world of enterprise computing and information systems – SAP HANA. As our website covers all the news related to SAP certification, we could not avoid writing about SAP HANA certification. Although HANA is still a very young development from SAP, the leading ERP vendor enthusiastically pushes HANA to the market and has big expectations about this new software product. We are not yet ready to create a separate section on our website that would be exclusively focused on SAP HANA certification (like, for example, we have for SAP FI certification), but as HANA is a really hot topic at the moment we will at least have an article about it. To begin with, let us first understand what SAP HANA actually is and why companies might want to buy it. SAP HANA is in-memory database system. Comparing to tradition database (DB) systems SAP HANA benefits from access to the low cost main memory (RAM), high performance of multi-core processors and speedy data access capabilities of solid-state hard drives. For this reason, performance of analytical and transactional applications on HANA platform is considerably higher than of traditional DB systems. 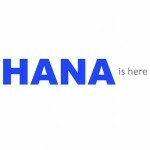 When I first saw an announcement about SAP HANA my first though was what does HANA mean? Is it acronym or just a name? Well, according to Wikipedia, HANA is indeed a name and not an acronym. Nevertheless, some people managed to invent explanations for this name. There are two popular interpretations. The first is HAsso’s New Architecture (a reference to SAP founder Hasso Plattner). The second is High Performance ANalytic Appliance. SAP Education was quick enough to develop training courses for SAP HANA and also SAP HANA certification to evaluate skills of people to configure HANA. At the figure below you can see an overview of the current training offerings and certifications in SAP HANA. The course curriculum starts with HA100 course which is a two days class and is suitable for all audiences. Next, it is split into 2 different directions – technical administrators attend TZH200 and then they can sit for certification that is called SAP Certified Technology Associate – SAP HANA 1.0. Another direction is meant for the application consultants and starts with HA300 course. Eventually this path prepares you for certification that is called SAP Certified Application Associate – SAP HANA 1.0. According to SAP, currently this certification is in the highest demand. 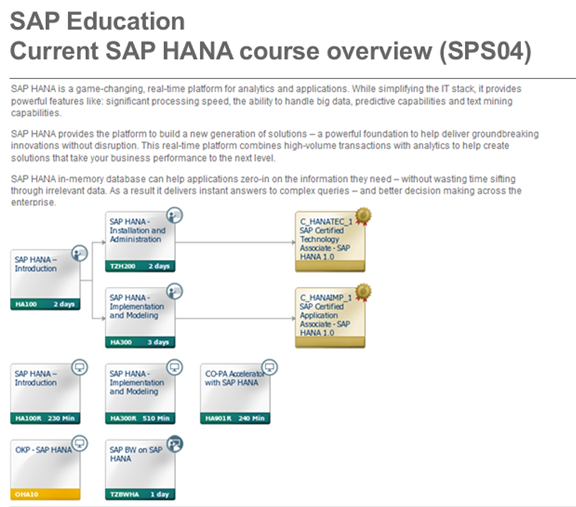 The middle row illustrates online SAP training courses that are offered virtually via e-learning – HA100R and HA300R. HA901R covers HANA with CO-PA accelerator. Training course OHA10 is delivered online as well. A course about integration of BW and HANA is called TZBWHA. Certification in SAP HANA at the professional level will address more experienced application consultants. It is currently not available yet and is planned to be launched is the middle of November 2012. Are you planning to enter SAP HANA area? Maybe pass SAP HANA certification? Do you think it is going to be the next big thing? As usual, let us know in the comments section below (you do not need to register for commenting)! HAHA is actually the next big thing and there is a big demand for this technology. Therefore, we’ve created a permanent page about SAP HAHA certification.